Andrew Peterson, Sara Groves, and Over the Rhine will perform at the Contemporary Christian Music Festival Aug. 11 in Winona Lake, Ind. The Contemporary Christian Music Festival will take place on Saturday, August 11, from 5 – 9 p.m. at the Village Amphitheatre on Tabernacle Lawn, 801 Park Ave., Winona Lake, Ind. Part of the Grace College and Village at Winona Festival of Music, the free, outdoor concert will feature three groups performing a variety of music. 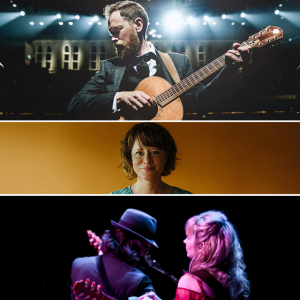 The lineup includes Sara Groves, Andrew Peterson, and Over the Rhine. Sara Groves blends a melodic style with a passion for justice and mercy, which has led her to partner with International Justice Mission to advocate for victims of human trafficking for the past 12 years. Groves has been nominated for seven Dove Awards and released a string of successful albums. Her most recent, “Abide With Me,” is a collection of hymns recorded in a 110-year-old church. Andrew Peterson’s folk-influenced music displays a highly creative mind. Peterson recently released “Resurrection Letters: Prologue” and “Resurrection Letters: Vol. 1,” a prequel in two parts to the highly successful “Resurrection Letters: Vol. 2,” released ten years ago. In addition to producing music, Peterson has written a series of four children’s fantasy novels and founded the non-profit organization,The Rabbit Room, to promote artists in the tradition of C.S. Lewis, J.R.R. Tolkien, and the Oxford Inklings. Over the Rhine is the duo of Linford Detweiler and Karin Bergquist. The group’s first recordings are from 1989, when the band was just starting in the neighborhood of Over-the-Rhine in Cincinnati, Ohio. Detweiler’s lyrics create a space for Bergquist’s vocals to bloom, and the two often collaborate with other musicians to create music that lives and breathes. The next Festival of Music concert will take place Sept. 8 and will feature John Mark McMillan. Visit grace.edu/musicfestival/ for more information.